Vite is a decentralized platform for event creation, promotion, and ticket sales. Vite events and tickets are verified through smart contracts on the Ethereum blockchain decreasing promotion costs as well as the prevalence of counterfeit tickets. 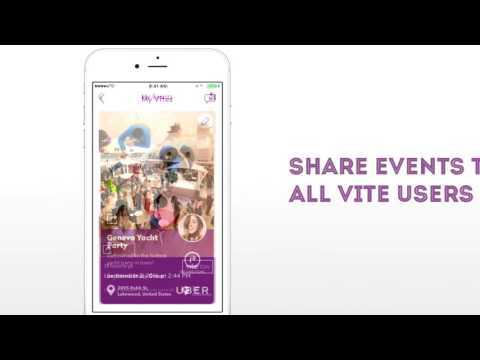 Vite is unique in that allows event planners to select exactly who receives an invite to events, show real-time footage of events, and to share events on the app from other social media platforms. This is ideal for all events and significantly decreases the cost of hosting private events, corporate events, and even pop-up shops. It is the most efficient way to create, market, and promote events and is designed to save event promoters money and time. The project provides value to the ecosystem by eliminating siginificant market inefficiencies in the event creation and promotion industry. Competing blockchain technology is not as far along in development, does not have the same functionality, and competitors don't offer features unique to Vite such as controlling specifically who receives invites to events and streaming live event feeds. Vite tokens are ERC20 utility tokens. Anyone that owns VITE tokens is a token holder and can participate in the Vite ecosystem. For example, VITE token holders will receive a reward for verifying events. The initial reward will be the VITE that is used to fund the event. Vite is a decentralized platform for event creation, promotion, and ticket sales. Vite events and tickets are verified through smart contracts on the Ethereum blockchain decreasing promotion costs as well as the prevalence of counterfeit tickets. Vite is unique in that allows event planners to select exactly who receives an invite to events, show real-time footage of events, and to share events on the app from other social media platforms. This is ideal for all events and significantly decreases the cost of hosting private events, corporate events, and even pop-up shops. It is the most efficient way to create, market, and promote events and is designed to save event promoters money and time. Vite is an innovative platform created with event-goers and promoters in mind. Vite appeals to the masses because of its simple to use interface, its unique ability to streamline event planning, promotion, ticket sales, and its social media interoperability. Currently, there exists no other application with the look, feel, and capabilities of Vite. Utilizing the Ethereum blockchain, Vite can provide a decentralized event hosting and ticket distribution network. Companies and individuals can create events, buy, and sell tickets through unforgeable cryptographic VITE tokens. By decentralizing event promotion, Vite significantly decreases the cost associated with event marketing and promotion as well as the buying and selling of tickets. "Vite is the tinder for events" - great tagline, but is it needed? Team is lacking experience and I am unsure on whether the team works for Bitdreams or for Vite? As Bitdreams is just a company focusing on Initial Coin Offering (ICO), token creation, marketing and branding, business development, and capital fundraising. The founders of this site are listed as team members of Vite.. Additionally, the advisory board are also just people that are mentioned on bitdreams site and I cannot find any information on whether they are really endorsing Vite. Lastly the company working with Vite have Vitalik Buterin mentioned in the board of advisors, seems really doubtful to me. There is no Telegram channel and the one mentioned just links to Bitdreams and a welcome bot with zero interaction. Additionally, the reddit links to 1 single post and their Bitcointalk contains nothing but the standard "good project, i'm in" posts. The first Facebook post is from september 2017, however the ICO is just now? Roadmap is almost non-existend and providing zero details, additionally there is almost no useful information in the whitepaper. There might come a solution for event creating, promotion and ticket sales using the blockchain - but I don't think this project will be it. There is an app called "Vite Exclusive Events", it has 100 downloads and it was last updated in october, 2017. I have not downloaded this to check it out, but I do not expect much from it. The project might be legit, but I am not getting the feel it is, or at least that it needs the blockchain. Thinking Vite is just trying to lift off the crypto hype. Please stay wary. - Team seems loosely coupled / part time at the moment. Would have liked to see a plan for who and when people would be 100% committed to the project. Would have expected this given that they have raised $3M privately already. - Team does not appear to have a track record in startup or executive management experience. - Has raised $3MM in private traditional funding which is a very good sign. - $13MM hardcap is likely a little on the high side here, but definitely in the ICO sweet spot, and not excessive. - Success will be based on marketing / commercial execution, very little technical risk. - Fantastic that there is an app already out. - The project may lack hype, not because it is a bad initiative, but simply it is not a ground breaking topic for blockchain/crypto. - The white paper doesn't address why this team is uniquely positioned to make it happen. - Please feel free to reach out if you think I have misinterpreted something.. Happy to discuss it. - Token sale details are very confusing.. People will struggle trying to calculate this hardcap.. It is a low number so make sure it is public info outside of digging for it in the whitepaper. Fun project to build.. excited for you.. slay it. CEO of Phillip Buchanon Enterprises Inc.